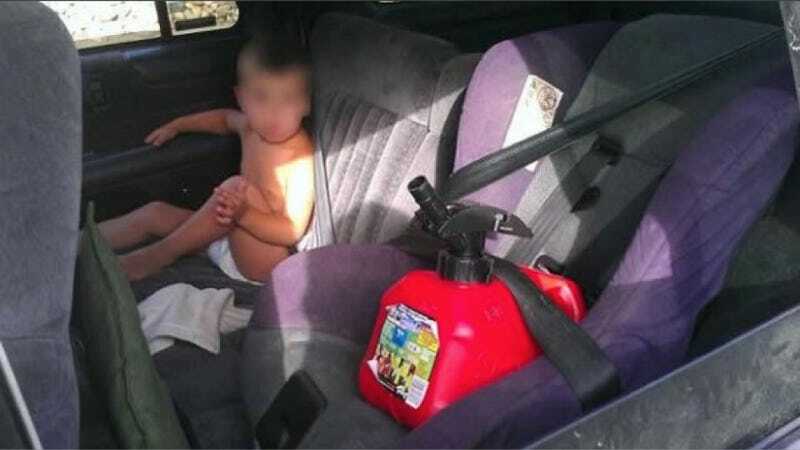 What happens when you strap a gas gan into a baby seat and leave your diapered toddler unrestrained in the backseat? This Aurora, Colo. woman got three seatbelt tickets for it, plus a barrage of public derision directed her way when the Colorado Department of Transportation posted a photo of the free roaming baby perched next to his mom's snugly buckled gas container. This looks like something that would happen on South Park, but it's real life. The so-far unnamed woman apparently exercises a laissez faire seatbelt policy in her car. Raw Story reported that one of her seatbelt tickets involved a 14-year-old. As one of the Facebook commenters reportedly pointed out, "High price of gas… will make you do crazy things."